Let us preface this by saying we're still gathering information, but word on the web is that Newegg is in the process of being owned by a Chinese technology outfit. Well, sort of. 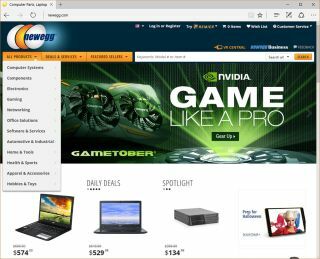 The trail of crumbs starts at Reddit where a forum member posted a link to an article on TechPowerUp titled, "Newegg Now Owned By Chinese Company." It's there where the bulk of information is posted in English, which itself is based on a Chinese-language report at United Daily News., the third-biggest newspaper in Taiwan. Still with us? According to UD News, Hangzhao Liaison Interactive Information Technology Co., Ltd. (Liason Interactive from here on out) is in the process of closing a deal to buy a 55.7 percent stake in Newegg. The deal is estimated to be worth around 17.7 billion yuan (around $2.63 billion), and once finished, the California electronics dealer would effectively become a subsidiary of Liaison Interactive. There hasn't been any official announcement of a buyout, though in mid-September, Newegg issued a press release saying that Liason Interactive was making a "significant investment" in the company. At the time, Newegg said the cash infusion from the investment would accelerate the company's strategic initiatives, including a broader international expansion and a desired aggressive push into core markets such as esports, virtual reality, and augmented reality. "Newegg is the destination of choice for technology enthusiasts who aspire to live a digital lifestyle," said Danny Lee, Newegg CEO. "This investment enables Newegg to further cement its leadership position, while accelerating into high-growth categories increasingly vital to our business in the long term." Terms of the deal were never disclosed, though if Newegg is giving up a majority stake as is being reported, it will be interesting to see where things go from here. There's plenty of skepticism and speculation about Newegg's future in the aforementioned Reddit thread, but we're more inclined to take a wait and see approach.